Flat 3,500 off on Galaxy On.Flat 3,500 off on Galaxy On. 13MP (F1.9) rear camera with LED flash. Good sound quality. The call should be heard clearly on both ends. Screen visibility in sunlight is poor. 1 Pricebaba user have written their experience with Samsung Galaxy On6. If you own Samsung Galaxy On6, please do leave your feedback too. Lowest price of Samsung Galaxy On6 price in India starts at Rs. 11,990 Samsung Galaxy On6 is available on Flipkart at Rs. 11,990. Prices updated on 22nd April 2019. 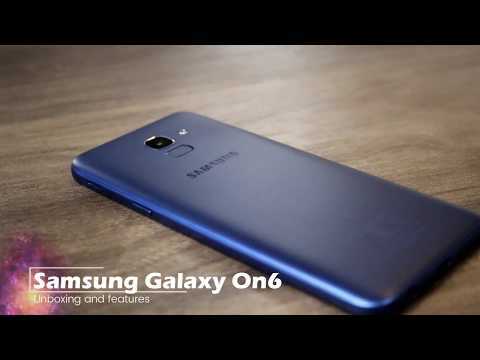 The Samsung Galaxy On6 provides a great user experience as it is inexpensive, has a bright display, is lightweight, has built-in speakers, and is durable. Sensors on the phone include a proximity sensor, fingerprint sensor, and accelerometer. With an impressive AlwaysOn 5.6 inch Infinity display, the Samsung Galaxy On6 features an aspect ratio of 18.5:9 and HD+ display. You can take amazing pictures with the 13-megapixel (f/1.9) rear camera of the Samsung Galaxy On6. It also enables high-resolution selfies with its 8-megapixel (f/1.9) LED flash front camera. The smartphone's Octa-core 1.6 GHz Exynos 7870 processor makes it compatible with most applications and software features. The phone comes in internal storage capacities of 64 GB with a 4 GB RAM and 32 GB with a 3 GB RAM. Samsung Galaxy On6 has a non-removable Li-Ion 3000 backup mAh battery for more usage hours. Its connectivity options include Wi-Fi, 3G, Bluetooth, FM and 4G (with added support for Band 40). Featuring the Android 8.0 (Oreo) operating system, the Galaxy On6 runs Samsung’s custom Experience UI on top.